BREAKING NEWS: Epcot's Illuminations Ending Soon! BREAKING NEWS: Epcot’s Illuminations Ending Soon! After nearly 20 years of delighting Epcot guests through music, fireworks, fire torches and more, Disney has finally announced that “IllumiNations: Reflections of Earth” will be ending in the second half of 2019. “IllumiNations: Reflections of Earth” is currently planned to run to the end of summer 2019. 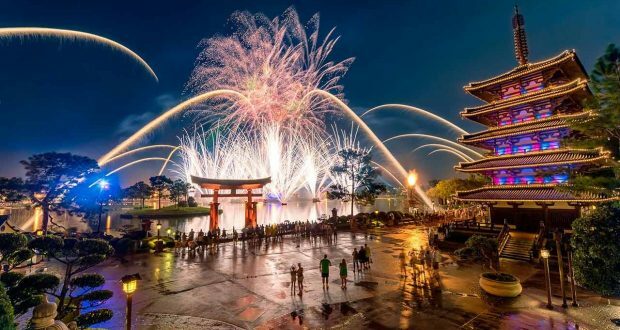 All Disney will say about the all-new nighttime fireworks spectacular coming to Epcot’s World Showcase Lagoon is that it will be part of the park’s ongoing transformation. If this development makes you sad, we’ve included an article below about 10 delectable new treats available at Disney! We hope this will cheer you up! 10 Entirely New Delectable Disney Foods You’re Gonna Love! It’s no secret that Walt Disney World Resort boasts some of the most enticing eats ever. From specialty snacks to more refined culinary presentations to be had at the various restaurants, the possibilities are seemingly innumerable. And as the place where brand-new magic is always in the making, it’s to be expected that you will often find a host of magical morsels constantly being added to different menu lineups all around. Here’s a look at just 10 entirely new delectable Disney treats you’re sure to love. Maybe reading about these will help cheer you up! Some months ago, this past autumn to be exact, diehard Dole Whip fans visiting Magic Kingdom Park’s Aloha Isle started to notice a new option on the menu—the Pineapple Upside Down Cake served with Pineapple Dole Whip. This novel treat adds a whole other twist to the already famous cool concoction of Dole Whip, which has been hailed by many as one of the very best signature Disney snacks of all time. This new item comes served up as a portable eat-as-you-go dessert that combines the sweet (but not too sweet) gooiness of traditional pineapple upside down cake with a topping of none other than Disney’s own exclusive Pineapple Dole Whip soft-serve. The decadent mini cake consistency is comprised of glazed pineapple chunks and maraschino cherry slices, and in order to prevent the rapid melting of the Dole Whip topping the cake is not served warm. So if you’re pining for pineapple this new item is perfect for you. 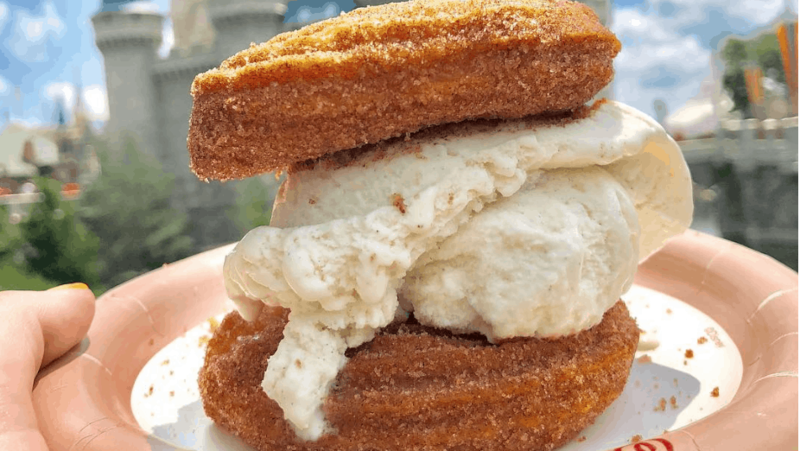 If you love churros and ice cream both then now’s the time to rejoice, because those highly popular Churro Ice Cream Sandwiches that are all the rage in Disneyland’s Downtown Disney sector have at long last arrived on the scene at Walt Disney World Resort. You’ll find them at Magic Kingdom Park’s own Sleepy Hollow Refreshments—a spot renowned for their many unique snack signatures, like their ever-popular Fresh Fruit Waffle Sandwich (with hazelnut spread) being just one example. Now guests can sink their teeth into something new—the cinnamon-sugary sweetness of two churro-based sandwich ends filled with classic vanilla ice cream in the middle. It really hits the spot on a hot Florida day and makes the perfect light snack or even a delightful dessert pairing with a quick counter service pick from one of the surrounding eateries.